The shoes are new never warn. There are no marks on the soles of the shoes, indicating use. Sorry the first batch is a bit over exposed. Great shape they are marked '9 1/2 A". Includes Original Bruno Magli Box. 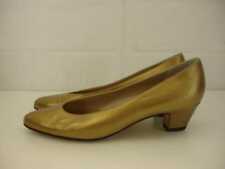 Gold Leather Wrapped Tapered High Heel. Leather Sole. Leather Uppers. Leather Lining. Why donate when you can get cash back?. Be sure to add us to your favorites list ! Designer: Bruno Magli. Includes: Bruno Magli box and shoe bag. Black satin slingbacks by Bruno Magli for sale. Size: 8 AA. Length: 9.1" from heel to front of toes. Width: 2.9" at widest part of soles. Heel: 3.25". Bruno Magli Made in Italy Bologna size 8 AAA Black Woman's High Heel Shoe. Marked on bottom of shoe 8 AAA. Beautiful, very good used condition. Bruno Magli patent leather cap toe with embossed leather sides. Very classic and very attractive. Mild to average wear on the entire shoe with no glaring defects. Very well taken care of. 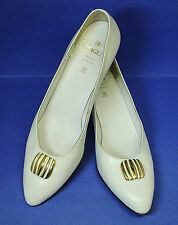 BRUNO MAGLI ITALY SZ 8 AA BLUE SLIP ON WOMEN PUMPS SHOES WS5-2-9. Condition is Pre-owned. Shipped with USPS Priority Mail. Bruno Magli Pumps Shoes Size 7.5 Black Open Toe Leather Made in Italy. Length = 9 3/8 Widest wide = 3 1/4. Type: Block Heel Booties. Material: Leather. Very good condition. Please see photos for condition. Any questions or want more pictures just ask. Thanks for looking! We respond to all issues within 24 hours. FREE scheduling, supersized images. Buckle closure. Made in Italy. Over 100,000,000 served. FREE scheduling, supersized images.